The Dove is the bird of Peace, Love, and Piety. As a representative of God, it is one of the most iconic and universal symbols of faith and devotion. This humble little bird started its journey as a religious icon in the Near East and Mediterranean. Thousands of years ago, the Dove was symbolic of the Canaanite mother goddess, Asherah, and her numerous counterparts across the region, as such, the Dove became a symbol of Femininity and Fertility. With the expansion of the Roman Empire, the Dove became absorbed into their religion, and soon, it was the emissary for goddesses like Venus and Fortunata, linking it with traits like Love, Peace, Luck, and Beauty. Before the Roman influence, The Dove was already a main fixture in the Jewish faith and, with the spread of people and ideas, the little bird easily transitioned to the Christian concept. The Dove has been featured throughout the Torah and in many Old and New Testament passages, the most popular of which includes the Baptism of Jesus Christ and the story of Noah and the Great Flood (which is believed to be an adaptation of the Mesopotamian tale of Gilgamesh). In this context, the bird's image was linked with God and the Holy Spirit. In Islam, the Dove enjoys a lofty status as an animal to be loved and respected. This is due to the tale of the Dove and the Great Prophet. It is said that a dove once offered assistance to the Great Prophet, allowing him to escape the clutches of his enemies. In the 20th century, the Dove became intrinsically linked with world peace and unity thanks to the famous Picasso Dove. The art piece, created by the legendary painter as an insignia for the first International Peace Congress in 1949, was considered to be ground-breaking for its sense of realism and the twist to the traditional image of a dove. In the post WWII era, Picasso's Dove resonated with the war-wary planet and its popularity soared. Today, the Dove is a universal totem of spirituality, Peace, and message of fraternity and tolerance. Dove Tattoos evoke a sense of inner tranquillity and most of these designs have strong religious themes. These tattoos can be simple or extremely detailed, but tend to generally lack any flashy show of color. Instead, artists are motivated to tone down the color scheme and, for complex designs, they opt to focus on the intricacy of the piece or add numerous religious elements. In some sense, detailed religious pieces are seen as a test of faith and endurance. In major world religions like Christianity, Judaism, and Islam, the Dove is a representative of God. Its image is considered to be a sign of reverence and humility. In a bid to be more creative, some persons opt to combine elements from native world views (like tribal patterns and markings) as a way of acknowledging other traditions. For some, a Tribal Dove Tattoo is a way to pay respect to your faith and still tip the hat to your cultural background. A dove carrying an olive branch is the quintessential image of Peace and Brotherly Love. The concept of the Peace Dove is closely linked to the story of Noah and the Great Flood. According to the Bible, after other unsuccessful attempts to find dry land, Noah sent a dove out on the quest. The bird returned with an olive branch in its mouth symbolizing God's promise to not create natural disasters of that magnitude ever again. The Peace Dove symbolizes Unity, Love, Peace, and an unbreakable promise to someone you love. The image of hands clasped in prayer is one of the many iconic images associated with Christianity. Commonly found on tombstones and mausoleums, Praying Hands symbolize humility and reverence before God and the gesture is meant to be a way of asking for mercy. When the image also features a dove, it is meant to symbolise God's promise to mankind and lets the world know that God listens and cares for his disciples. Praying Hands with Dove represents deep religious convictions and your faith in Christ. These designs are usually done in memory of a loved one. An angel is God's emissary; he or she is God's representative charged with the duty of keeping watch over humanity, protecting God's flock, and carrying out His will. In the same light, so too are doves. They are charged with the task of bringing the message of Peace and Love, and are signs that God has bestowed his blessings on a particular person - when Jesus Christ was baptized, a dove flew down from heaven and rested on him. Angel and Dove Tattoos are symbols steeped in Christianity; they convey the message that you are God's disciple and that He has a watchful eye over you. These designs are usually done in memory of a loved one as a way to let the world know that your loved one is now under the protection of the Almighty. In 1949, famed painter, Pablo Picasso, created a simple lithograph of a white dove for the World Peace Congress. Entitled The Dove (La Colombe), the image became a renowned symbol of Peace and Goodwill. At the time, it was considered to be revolutionary for Picasso to paint the bird without the traditional olive branch in its mouth; an image that had been the popular for thousands of years. The Peace Dove showed Picasso's stance on war. La Colombe later became one of the symbols of the Communists. 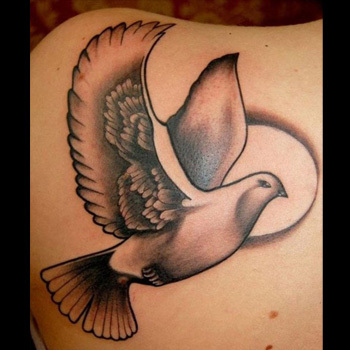 A Dove Tattoo is a great way to show pride in your religious convictions. The design is loaded with symbolism, as such, your main focus should be on Placement instead of Purpose. Need inspiration? Then take advantage of our Custom Design Service. Our team will be more than happy to help design a truly memorable piece.